It seems that many of my teenage girlfriends were named either Pat or Pam. Elsewhere, I have described Pat Beckett, a Mod girl who I met at The Scene Club in November 1963, but from 1959 until the summer of 1962 I was going steady with Pat Smitherman. In fact our break-up precipitated my transition to Mod. When I first met her I was wearing Teddy Boy styles. I was fifteen and already working full-time in the greenhouses at Rochford’s Houseplants. From the mid-1950s, working-class high fashion consisted of drape jackets, often with a waistcoat, and tight drainpipe trousers. Ideally, shoes were suede, crepe-soled brothel creepers sometimes worn with luminous pink socks (green, blue, red). Hairstyles for boys (and some girls) were variations of the Tony Curtis with a D.A. Males might wear a bushy forelock or a brilliantined “elephants trunk” which pointed to the front. Jefferson (1975, p. 85) includes a general description: “It was usually long, combed into a ‘D-A’ with a Boston neck-line (straight cut), greasy, with side whiskers and a quiff.” (2) The “south bank” was a variation which combined a crew-cut brush on top with swept-back hair at the sides and the obligatory sideburns. Teddy Boy styles seem to have arisen somewhat democratically from grass-roots impulses, but by the end of the 1950s, according to the more commercially contrived dictates of fashion, the jacket length had swung to the other extreme and the long drape style gave way to short Italian bum-freezers while the chunky creepers were supplanted by pointed winkle-pickers. I met Pat at the local fairground. I was sporting a Mississippi gambler look with a light gray drape jacket with velvet on the shoulders, drainpipes, and a homemade bootlace tie. Pat was wearing a short white plastic mac, a tightish knee-length skirt, and seamed stockings. She also wore a felt Robin Hood hat with a feather in it which I held for her during the rides. These were fashionable for both sexes in North London in 1959-1960. My mate Gordon Harris wore one to cover the bald patch he got when his fluffy ginger quiff was torn from his scalp by his machine at the Rolling Mills in Brimsdown. Gordy’s old man was a dustman and he lived, like Pat in a council house to the east of the Great Cambridge Road in Enfield. 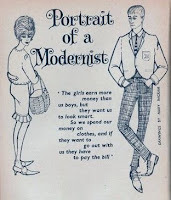 In his article “Portrait of a Modernist” (August 1961), John Watney describes eighteen-year-old Modernists of that time, “bum-freezer jackets; narrow trousers, sometimes with a button or two by the ankle; and long winklepicker or chisel-toed shoes.” In my attire I was veering towards Modernist fashions, but although I saw ankle buttons on trousers they were too fancy for me, and despite everything else, my hair was still swept back with a Brylcreemed quiff, unlike the hair of Modernists as described by Watney: “the uniform is short hair-style brushed forward over the brow, never backwards and never a sideboard.” (6) I didn’t change my hairstyle until August 1962 when I switched totally to the Mod look. Pat Smitherman had fair hair which she lightened further and wore in a blonde beehive (bouffant) and occasionally put on a headscarf in Teddy Girl style. According to Watney “[Modernist] girls dress their hair in a flashy imitation of the latest women’s magazine styles; wear too tight and too short dresses” [relatively short that is, the mini-skirt did not appear until 1966/67; the illustration shows a knee-length skirt]. Helen Shapiro recalls Mark Feld’s female companions, “The girls’ winkle pickers were at least nine inches long and they had tight, tight dresses.” Pat wore white high-heeled winklepickers, tightish dresses, frilly blouses and chunky white cardigans. Watney also recalls “round skirts with a multitude of petticoats frothing about their knees.” For a while when they were popular, Pat wore such belled skirts that stuck out. Hooped petticoats were used to support the flare and often the hoops didn’t gracefully accommodate sitting-down, and they would bounce up, much to Pat’s distress. That’s probably why the fashion didn’t last very long. At the Royal there were embryonic Mods; individual stylists, fancy dressers, who were not yet identified as a group and by no means in the majority. For example, I remember a bloke with pompadour hair who danced in heeled footwear. He was definitely ahead of the pack, but at the time I thought he looked a bit poncy, but nevertheless he stood out. Ironically, by autumn 1962, I was striving to look like him and had my own pompadour hair style with a high parting. Penny Reel states, “Precursors of the new look wear their hair short in the French style back-combed, and with a centre parting.” At this point I have to state that although we hear about Mod males back-combing their hair, and later during the psychedelic era I did tease my hair in a freaked-out style, I never did as a Mod. Instead I achieved my high crown by careful grooming. I cut my own hair at that time and the hair of many of my mates. The Royal had an impressive play list which included: Johnny Otis’s “Willie and the Hand Jive (released 1958), “Sea Cruise” by Frankie Ford (1959); “Money” by Barrett Strong (1959); “Shop Around” by the Miracles (1960); “Stay” by Maurice Williams (1960); and “New Orleans” Gary U.S. Bonds (1961). 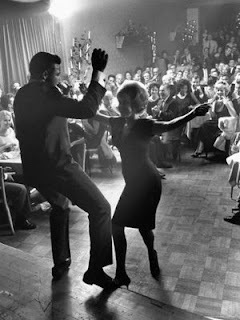 In 1961 the Twist became the rage when Chubby Checker released his cover of Hank Ballard’s “The Twist” and followed up with “Let’s Twist Again.” Later that year “Peppermint Twist” by Joey Dee and the Starliters was popular and was featured in a movie. I twisted with Pat at the Royal. It was an energetic dance but the Royal teenagers gave it their all. In due course Little Eva released “Do the Locomotion” (1962) which included conga lines of dancers snaking like a train, but by this time I had become weary with going steady. I felt confined and my future seemed to be closing in. This wasn’t helped by Pat hinting she wanted to buy some knives and forks “for the bottom draw,” which augured a seemingly inevitable and unwelcome fate. My change of heart first began in autumn 1960, when, as part of a dental technician apprenticeship I attended classes in Kingsway, Holborn, once a week. I made new friends Allan Cowell and Terry Bunyan who had modern soft hairdos. While Terry wore his fair hair in a short college boy style, Alan had the fringe brushed over his forehead in the style which later came to be known as the Beatle cut. One classmate, who I only remember as Englar was very stylish, a prototype Mod really, with dark hair parted in the middle ala Ray Davies. He was not a dental technician but a trainee chemical lab technician and he had a superior manner and stayed aloof. Allan and Terry dressed well, but they were just regular geezers, not a trendsetting Modernist like Englar. 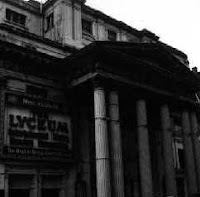 The first Mods I saw in significant numbers were at the Lyceum ballroom in Aldwych in the nearby Lyceum Ballroom in early 1961, though they were not yet known by that name. At midday Allan and Terry and I would go to the lunchtime Lyceum dances where secretarial workers in Holborn socialized with Covent Garden boys from the adjacent fruit market. Entrance was a shilling apiece. Although a variety of music was played, the only tracks I definitively remember are both instrumentals; Johnny and The Hurricanes’ “Rocking Goose” (1960) and Bill Black Combo’s, “Don’t Be Cruel” (1960). Watney in his 1961 article states, “The Modernist wears an Italian-style V-neck pullover or a cardigan.” Although predating the term Mod, these young men were setting trends. They were adopting a French look with soft hairstyles and continental clothes. I remember neat sleeveless V neck sweaters worn over shirts, with tweed trousers, baggy but not belled; and that mustards and pastel colors held sway. Similarly, the young ladies at the Lyceum were chic, and for me, Pat to whom I returned in the evening, compared unfavorably. “The prettiest girl in the village” was no longer “the prettiest girl in the world.” Barnes reminds us that “In the fifties, girls were still corseted and strapped up in suspender belts, pantie girdles and all that corrective brassiere stuff” (1979, p. 16). I found out recently that Pat passed in the early 1990s, may she rest in peace, and I feel like a cad for saying so, but at the time Pat, with her bouffant, suspender belts, stockings and lace petticoats, seemed to belong to an earlier generation. I felt that there must be more to life than this! (1) Alfredo Marcantonio, originally published in QX Magazine, from Jack That Cat Was Clean website. (2) Tony Jefferson. 1975. “Cultural Responses of the Teds.” In Resistance Through Rituals: Youth Subcultures in Post-War Britain. Eds. Stuart Hall and Tony Jefferson. London: Hutchinson. (3) Barnes, Richard. 1979. Mods! London: Eel Pie Publishing Ltd.
(4) Penny Reel, 1979. 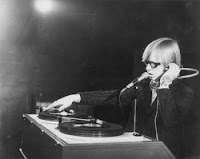 “The Young Mod’s Forgotten Story,” New Musical Express, from Jack That Cat Was Clean website. (5) Excerpts from Helen Shapiro's 1993 autobiography, Walking Back to Happiness, courtesy of Brian Nevill, Original Modernists 1959 -1966 website, May 13, 2011. This work is the copyright of Robert Nicholls, Ph.D. The views expressed are purely those of the author and are not attributable to any other person or institution (except where stated). You can also read Rob's memoirs of being a mod in 60's London - the first part of his story can be found here) and look out for the next part of this article in which he will talk about the Original Mods in the Media.